So you’ve taken your car for routine maintenance at your local Sedalia service department and they tell you that you need a radiator flush. Wondering exactly what a radiator flush is and if you really need one? Radiator flushes are important maintenance for your car. Think of them like the occasional bath for your car’s coolant system. Unfortunately, unlike neglecting baths, it is very difficult to smell out when a radiator flush is needed. Instead, you’ll find yourself dealing with bigger car problems. Read more to understand why you should say okay when your trusted auto technician suggests a radiator flush. Your car’s coolant system involves a radiator, a thermostat, and coolant lines that run through your engine. Coolant, also known as antifreeze, is poured into your radiator’s reservoir, where it goes through the radiator fins and into the engine as governed by the car’s thermostat. Coolant works to ensure that your car’s engine doesn’t get too hot and overheat, and it also makes sure that it doesn’t expand and crack in very cold weather. 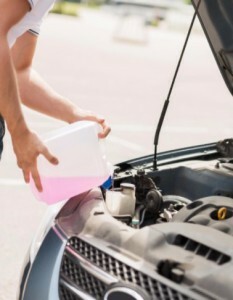 In northern climates, coolant is often used straight, while in other parts of the country like Missouri, some car owners mix their coolant half coolant and half water. Overtime, minerals and impurities from the water mixed with coolant and breakdown of the coolant itself can cause deposits to build up within the radiator and the engine. A radiator flush works to remove any deposits within the radiator and engine. During a radiator flush, an auto tech will drain the existing coolant, use a product to flush the car’s system of deposits, and then add new coolant back into the radiator. Sounds fairly easy, right? So easy you may consider doing it yourself. But it’s better just to let a trustworthy auto repair shop perform the radiator flush. For one, anything involving a radiator can be potentially dangerous. Pressure builds under radiator caps and, if you’re not careful, it could blow up in your face…quite literally. Also, coolant can be dangerous near your exhaust pipe and can cause paint damage to your car. Furthermore, most auto manufacturers have specially designed coolants to operate efficiently in their engines. You probably want the coolant that was intended for your car. As we mentioned before, there are no real signs that you’ll need a radiator flush, though you can check your owner’s manual to see how often they recommend one. Otherwise, you’ll need to rely on taking your car in for routine maintenance and trusting when the technicians recommend this service. Like most routine auto maintenance, a radiator flush extends the life of your car – in this case, specifically your car’s engine. To recap, a radiator flush is just one of those things that you ought to have done when the professionals recommend it. Bringing it to the dealership ensures that you’ll get a quality job as well as the correct coolant for your automobile – be it a Dodge, Chrysler, Jeep or any other make. At Sedalia’s Bryant Motors, we work on ALL makes of cars, trucks and SUVs, as well as any other car you bring our way. Keep learning more about auto repairs or, if you’re in the Sedalia, Jefferson City, Marshall or surrounding areas, contact our service department today to schedule routine maintenance for your car.